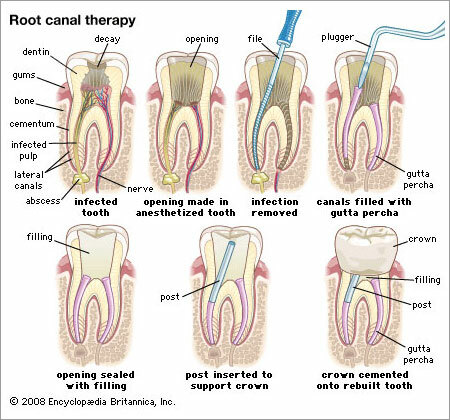 Root Canal Therapy Root canal therapy is required when the nerve that exists in the centre of your tooth becomes diseased. The goal of a root canal treatment is to preserve your tooth. A root canal treatment is required when the nerve that exists in the centre of your tooth becomes diseased. This may result in acute pain or the nerve may sometimes die without any symptoms at all! At Takapuna Dentists we detect when there is a problem and perform root canal treatment, or endodontic treatment, by clearing out the infected tissue inside your tooth and filling the empty space with biocompatible materials.ular). It's vital to have this done early, before your tooth becomes infected, the pain worsens, your face swells, an abscess forms and/or your tooth is lost. Signs that root canal treatment is needed can include spontaneous pain or throbbing in the tooth, pain while biting or chewing, prolonged tooth sensitivity to hot and cold and discoloration of the tooth.